Stay Healthy – Follow Us! 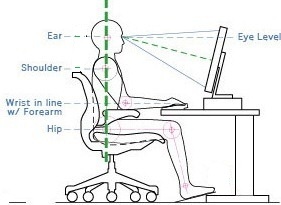 Ergonomic Consulting can help improve your employees posture and biomechanics for increased workplace productivity. The goal of an ergonomic program is to arrange the work space to fit the worker (chair, desk, keyboard, mouse and monitor) and not the other way around in order to prevent employees from becoming patients due to repetitive stress injuries most commonly the back, neck, forearms and wrists. Work Comp claims can cost your workers compensation insurance company $31,000 on the very low end as well as cost you in lost work time, training, overtime, etc. and eventually will lead to a higher insurance premium for you. It is best to be proactive! 1. Online Ergonomic Screening Survey – save time and money by screening your staff ($15/employee up to 300 workers). By screening your employees you will find out who is at risk before they are injured. If an employee is at risk it is then recommended to get an ergonomic evaluation. a. In Depth Ergonomic Evaluation Report – Recommended as documentation is the key to minimizing as much risk as possible and protecting yourself against lawsuits and complaints. 4. Write a report with recommendations. 5. Help employee re-arrange their work station. b. Verbally make recommendations and help employee re-arrange their work station. 3. Employee Lunch & Learn Workshop – Choose from any workshop topic, or propose an idea. These workshops include a lecture, Q&A, and interactive activities. Presentations can be customized to last anywhere between 30 minutes to 2 hours, depending on the size of the company and the request of the employer. “Home & Car Posture” is the most popular talk and I recommend all companies start with it because the last thing you want is your employees bringing their poor posture and biomechanics to work and claiming it as a work injury. I will go over proper posture while sitting in your car, watching TV, reading, using your laptop, sleeping (positions, mattresses & pillows), and proper use of your phone in order to avoid “Text Neck”. This info is invaluable in minimizing repetitive stress injuries. Mother always told us to sit up straight, but why? Once they know the “why” and how it relates to muscles, discs, nerves and pain it will be a lot easier for them to want to practice proper posture. Other talks include Adjusting Your Work Station, Exercise, Stretching, etc. 5. Corporate Wellness Programs – On-site Chiropractic, Massage Therapy, Stretching, Strengthening, Ergonomics, Fitness Consulting, Nutritional Guidance and ongoing health education programs. As per a recent study conducted by Harvard University, for every dollar that a company spends on corporate wellness programs, there is a drop of $2.73 on absenteeism related costs incurred by a company. Employee wellness is regarded as a high return on investment for employers because of increasing health care costs. Every dollar invested in employee wellness program brings a greater return on reduced health care cost and lower absenteeism cost. 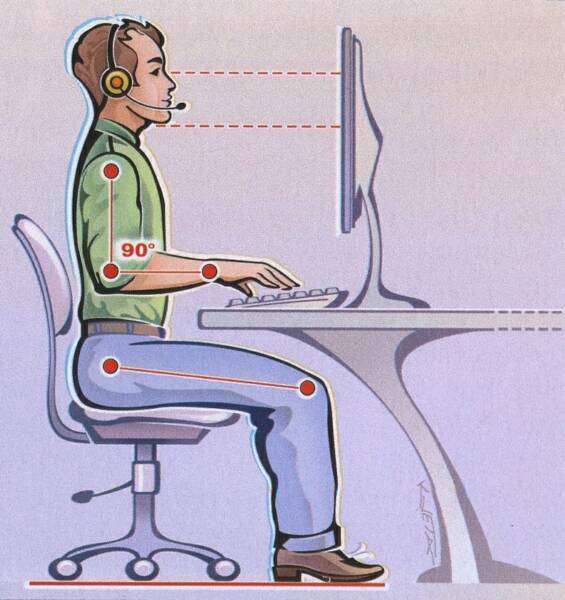 Ergonomics is the study of people in their working environment. The goal of ergonomics is to design or arrange the work-space to fit the worker and not the other way around. Ergonomic Consulting helps to prevent repetitive soft tissue injuries and pain. The average office worker will spend 6.5 hours/day in front of their computer or laptop. Repetitive Soft Tissue Injuries are brought on by poor posture and biomechanics. Ergonomic Consulting – Why do an Ergonomic Evaluation? What does Ergonomic Consultating consist of? Evaluation of workstations for safety by assessing the potential risk of repetitive stress injuries (Carpal Tunnel Syndrome; Neck, Back, Wrist, Elbow and Shoulder pain/injuries, etc.). This can be done onsite or through our risk assessment survey software questionnaire filled out by employees to identify employees most at risk. Recommending equipment options to you for your employees such as a lumbar support, foot rest, footrest, wrist rest pad, mouse, chair, keyboard, Sit & Stand desk, – usually fairly inexpensive and can be purchased through Amazon, which is cost effective, returnable and easy. Educating and training your employees on proper posture (sit, stand), biomechanics (movement) and stretching. Educating your employees on correct posture for their car, phone and home so they don’t bring their musculoskeletal problems to work. Would you, your family or employees like to learn how to ergonomically set up your surroundings to help decrease your pain and risk of repetitive injuries? Posture is NOT an easy thing to change. I offer in home and work Ergonomic Consulting, because I know that employees and patients need an objective outside eye. I know how it is to be in pain as I suffer from 1 herniated disc in my neck and 4 herniated discs in my lower back. 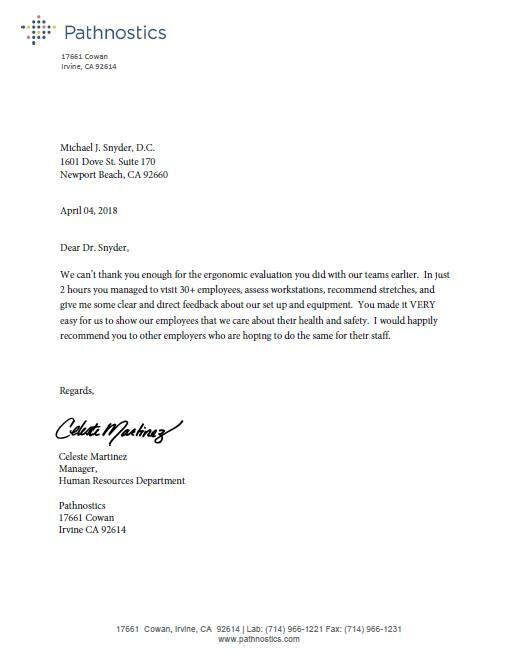 In 1998 my lower back pain and right leg weakness was so bad that I had to sell my practice in Santa Barbara and take some time off treating patients. I have since worked extremely hard on my posture, biomechanics and made sure that my surroundings (couch, chairs, bed, car) were ergonomically safe. 1. Always try and keep the forward (lordotic) and backward (kyphotic) curves in your spine. 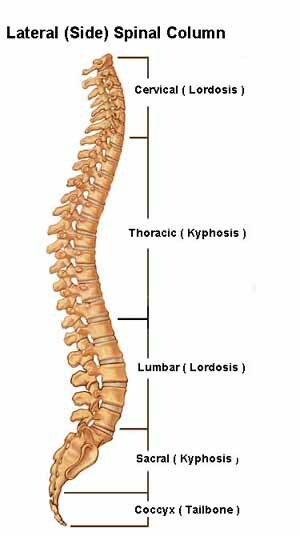 These curves are your friend as they work like a shock absorber and distribute your weight evenly over each vertebrae and disc. Scolioisis on the other hand is not good and it is a lateral curvature of the spine from side to side. So avoid postures where your body is tilted to the side for extended periods of time. 2. Sitting – keep your knees and hips at 90 degrees and sit all the way back in your chair with the small of your back supported keeping the curve in the lower back. If your chair does not have a lumbar support already built in you can buy one or roll up a towel about the same diameter as your wrist and place it in the small of your back for support. 3. Make sure to set up your workplace correctly. Get an adjustable chair that will allow your hips and knees to be at 90 degrees. Once in this position your computer keyboard or the desktop should be at a height that will NOT cause you to shrug your shoulders or cause you to hunch forward but will allow you to sit in a very comfortable postion. Put the keyboard and monitor straight in front of where you will be sitting so that your eyes are looking straight ahead. Sounds easy but so many people do not do this. 4. Remove your wallet from your back pocket while sitting, especially if it is rather large as this acts like a shimmy and tilts the spine from side to side putting unnecessary stress on the weaker areas of the spine (see skeletal image on left). 5. Most couches will aggravate lower back conditions as they make you sit too low which does not allow you to keep your hips and knees at 90 degrees. Also, they make it difficult to get up and down from and don’t offer much lower back support, especially if it is a soft couch and almost all are. 6. Watching TV – Do not watch TV in bed with your head propped forward on several pillows to see the screen as this takes out the normal curve in your neck and causes subluxations which leads to a loss of the normal cervical lordotic (front to back) curve and causes Forward Head Posture (FHP) over time…look at diagram to the left. If you have to watch TV in bed and I do NOT recommend it but you can mount your TV as high as you can to minimize your head being propped forward. Do not watch TV on the couch with your head rotated or your body twisted as over time this will create subluxations in your spine. Sit directly facing the TV keeping your knees and hips at 90 degrees with your lower back supported. 7. Avoid watching TV and reading in bed with your head propped forward on several pillows as this will cause you to reduce the normal cervical lordotic curve and cause subluxations and Forward Head Posture (FHP)…look to image on left. 8. Sleep – Get at least 7 hours of restful sleep each night to allow your body a chance to rest and heal. Avoid water beds, hammocks, beds that are too soft and beds that are too hard as these will alter your normal lordotic and kyphotic curves. Once your mattress starts to dip down like a hammock or if you wake up day after day with lower back pain that gets better as the day progresses it might be time for a new mattress. 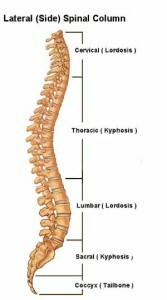 Get one that allows you to keep your natural lordotic and kyphotic curves of your spine. The memory foam mattresses work the best as they allow you to keep your natural curves of your spine. Try and sleep in a neutral position with no rotation in your spine. Sleeping on your side puts the least amount of stress on your lower back and is best for lower back conditions while sleeping on your back is better for mid back and neck problems. Sleeping on your stomach is not good as it puts your spine in rotation for hours at a time thus altering your natural curves and putting unnecessary rotaion into the spine over time and again causing subluxations. 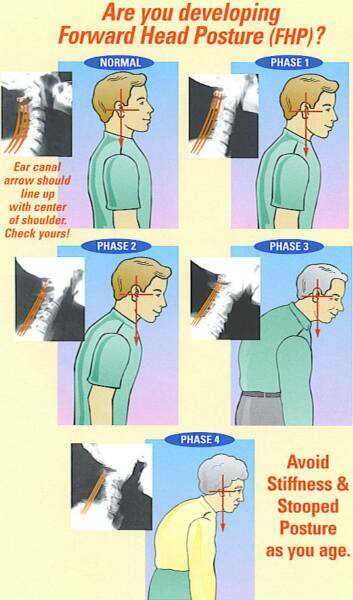 Sleep with only 1 pillow as 2 will cause Forward Head Posture over time. I recommend getting a memory pillow that supports your natural cervical lordotic curve (see image on left). If you are looking for a memory foam mattress or pillow just ask me I might be able to save you money as many of the mattress companies send me offers from time to time. 9. Lifting – If you have a lower back condition it is better to pay someone to do your lifting for you. Spending your money on movers or laborers may cost you more up front but it will save your back and money on treatment in the long run. If you do have to lift make sure you use a back support/brace if the object is heavy, keep the object close to your body, keep the lordotic curve in your lower back, lift with your legs not your back and do not twist and lift at the same time. 10. If you are Overweight, try to lose weight and get back as close to your optimal weight as possible. Excess weight will put more stress on your spine, knees, hips and feet, which will slow down the healing of your back. 11. If your in pain, avoid caffeine and sugar as they will make you more sensitive to pain. 12. Shoes – Don’t wear improperly fitting shoes as they will alter your gait (the way you walk). Unbalanced shoes can lead to a chain reaction of problems that can translate upward from your feet to your knees and even your spine. If you have a lower back condition, avoid high heels as they will excessively increase the lordotic curve in your lower back (sway back), jam the facet joints (posterior joints of the vertebrae) and make the holes where the spinal nerves come out smaller and thus increase the likelihood of pinching the nerves exiting the spinal cord. Wear comfortable, rubber soled shoes to absorb the shock of walking so that your back, knees and feet don’t have to. 13. Try and reduce the stress in your life as stress can cause muscles in the back to tighten and pull on the vertebrae. Easier said than done I know, but try to live in the moment. 14. Avoid Smoking because it will dehydrate the vertebral disc and that in turn will lead to degenerative joint disease. 15. What is the first thing an athlete does when they get an injury on the field…ICE! Always ice new injuries (20 minutes on and 1 hr. off and continue this until the swelling and or pain diminishes). Avoid heat as heat will increase the swelling of an acute/new injury. If you have just sustained a disc injury (usually a lifting and/or twisting injury) do NOT go into a hot bath, hot tub or jacuzzi as this will surely increase the swelling in the disc and there is a good chance you will wake up the next morning hunched forward and to the side, barely able to walk with a swollen disc. 16. Text Neck – yes this is now a term describing the symptoms that go along with looking down at your phone for long periods of time that will eventually lead to Forward Head Posture (see above). Try to lift your phone up and gaze down with your eyes. If you have any questions about how to set up your work-station or take care of your spine email or call me. Tammy V. sprained her ankle. We x-rayed and examined her prior to manipulating her foot/ankle. Her talus and metatarsal bones of the foot and ankle were adjusted. She made a full recovery within 2 days. Kyle Loza 3x X Games Freestyle Moto X Champ injured his neck while training. He was treated with specific Gonstead Chiropractic adjustments and Active Release Technique in addition to Deep Tissue Massage. John S. gets monthly Gonstead chiropractic adjustments for relief of his lower back pain and sacroiliac pain caused by his prosthetic leg. Angelo fractured (broke) his elbow and wrist and tore the ligaments to these structures and has been suffering from chronic Wrist & Elbow Pain. Angelo was treated with High Power Laser Therapy to accelerate healing and decrease swelling, inflammation and pain in his elbow and wrist joints. In addition Chiropractic adjustments were given to his elbow and wrist joints to help restore proper biomechanics of the joints. Steve B. came in for chronic knee pain and was treated with High Power Laser Therapy and Active Release Technique which resolved his problem. He re injured the same knee skiing a year later and we were able to resolve his pain again with Class IV Laser Therapy, stretching and deep tissue massage and sports massage. Sherry H. has suffered from Vertigo (dizziness, Light headed, spinning, floating, Motion sickness, Migraine, Nausea, vomiting, etc) for 7 years with no relief. Specific Gonstead Chiropractic Adjustments were used in order to give Sherry relief from her vertigo and allow her to get off her medication. She was also advised on proper posture and sleeping habits. Pat has suffered with sciatica for 6 years due to a Spondylolisthesis in her lumbar spine. A Spondylolisthesis occurs in about 5% of the population and happens when one vertebrae slips forward in relation to the vertebrae below. Pat’s Spondylolisthesis caused pinching of the nerves in her lower lumbar spine sending pain down her legs. We used high power laser therapy combined with stretching and chiropractic adjustments in order to relieve her pain. Dr. Snyder treated Forrest for chronic shoulder & elbow pain with high power laser therapy, active release technique and gonstead chiropractic adjustments. After treatment Forrest was able to pursue his dream of playing professional soccer in Europe. Blane S. has chronic lower back pain due to injuries and 9 low back failed surgeries and is on a number of pain medications. With Class IV Laser Therapy he has been able to not only cut his medication way down but he has not had to go in and get any cortisone shots from his pain doctor to cut the pain.